With the completion of a $48 million expansion of the Staten Island Bluebelt system in August, the project received the Envision Silver Award from the Institute for Sustainable Infrastructure (Washington, D.C.). It joins a $150 million upgrade to the 26th Ward Wastewater Treatment Plant (Brooklyn) as the only other New York City project to receive the award. New York City Department of Environmental Protection. As the southernmost borough of New York City continues to expand and improve its natural wetlands, it also continues to earn recognition for its efforts to adapt to nature to solve chronic flooding issues. 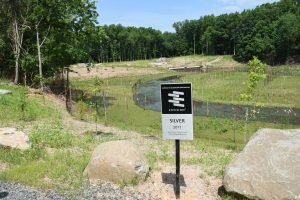 A sweeping Staten Island stormwater project, underway since 2014, in August received the Envision Silver Award from the Institute for Sustainable Infrastructure (Washington, D.C.). This project is only the second in New York City ever to receive the commendation. City officials announced that the latest expansion of the ongoing Bluebelt system project was completed ahead of schedule. The New York City Department of Environmental Protection (DEP) funds the project and the New York City Department of Design and Construction (DDC) manages it. 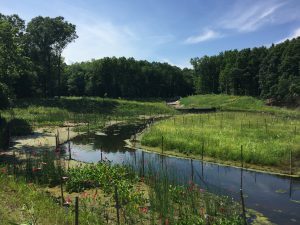 Under the project, DEP purchases undeveloped wetlands — known as “bluebelts” — and optimizes them to connect with existing storm sewers, creating integrated stormwater management systems. For the latest and largest leg of the Bluebelt project, the agencies invested about $48 million into both grey and green infrastructure in the Woodrow area of Staten Island. The agency also extended sanitary sewer services to nearly 600 Staten Island homes previously dependent on septic tanks for wastewater disposal. Under the Staten Island Bluebelt system project, funded by the New York City Department of Environmental Protection, New York City purchases and improves undeveloped wetlands to connect with existing storm sewers to create integrated stormwater management systems. New York City Department of Environmental Protection. To maximize the stormwater management capabilities of Staten Island’s existing wetlands, the investment also funded the planting of 723 canopy trees, 166 shrubs, and 36,850 plants and wildflowers. This combination of wetland-centered grey and green infrastructure will collect stormwater from roadways, convey it into the wetlands for natural filtration, and eventually drain it safely into the Raritan Bay. “The Bluebelt system on Staten Island has proven to effectively manage stormwater, reduce localized flooding, and raise nearby property values,” said DEM Acting Commissioner Vincent Sapienza. With the expansion, the Bluebelt system now provides drainage for 19 watersheds that cover about 5666 ha (14,000 ac). It provides cost-effective stormwater management to about one-third of Staten Island’s land area, increases accessibility to open community spaces, and serves as a habitat for a diversity of wildlife.